Hello, happy Tuesday! Hope you've all had a good week? Ours has been fairly quiet again, we've either been at home or at my in-laws which has worked out well as I've been able to crack on with a few jobs that have been hanging around at home and catch up with housework. We've also been doing lots of work books, maths mostly, as both the girls have been eager to do them. Whilst they're so keen to do learn, I stocked up on books so that we can take advantage and I hope that it will give T a little head start when she starts in reception. 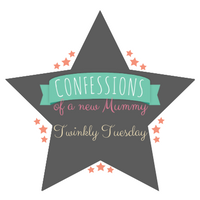 On to this week's Tuesday Twinkler and an interesting post from Rosie at A Rosie World who talks about how to dress now that she is in her 40s. As women, there is so much thrown at us about how we should look and dress and Rosie talks about how this changes as we get older. Surely age is but a number and how we dress should be down to what we feel happy and confident in, not what we 'should' be wearing? What are your thoughts? It's great that you are keeping your kids' skills strong throughout the summer!